Suddenly, everyone is talking about adding flaxseed to your diet. What is flaxseed and how can eating itmake you healthier? Flaxseed is the seed of the flax plant and can be eaten as whole seeds, ground into a powder (flaxseed meal), or the oil can be taken in liquid or pill form. There is evidence that it is a great way to incorporate dietary fiber, antioxidants, and omega-3 fatty acids into your diet. Flaxseed has been shown to lower cholesterol in some people and it may even reduce the risk of breast cancer. 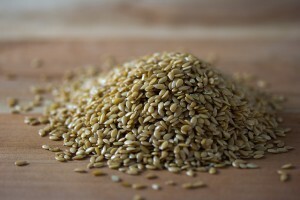 People take flaxseed to help with many digestive conditions, including chronic constipation, diarrhea, diverticulitis (inflammation of the lining of the large intestine), irritable bowel syndrome (IBS), ulcerative colitis (sores in the lining of the large intestine), gastritis (inflammation of the lining of the stomach), and enteritis (inflammation of the small intestine). According to the National Institutes of Health (NIH), more study is needed to prove that flaxseed benefits people who have these conditions. What’s in the Miracle Seed? Flaxseed is the richest source of omega-3 fatty acids, which is good for our hearts, brains, and normal growth and development. Omega-3 fatty acid can also be found in fish, plants, nuts, and oils made from nuts. No matter how you consume flaxseed—whole, ground or the oil—you will increase your intake of omega-3 fatty acids. Lignans are a type of plant estrogen that may help slow down certain cancers—cancers that depend on hormones to grow. Lignans also work as an antioxidant, which means they protect cells from the damage that comes with aging. Antioxidants—found in berries and many other foods—may help fight certain cancers. Lignans are concentrated in the coat of the seed so when flaxseed is expressed into oil, the anti-cancer and antioxidant benefits of the lignans are lost. Dietary fiber helps regulate the digestive system and can lower bad cholesterol. Dietary fiber in flaxseed is only found in whole and ground flaxseeds, not in flax oil. For women who have gone through menopause, a small daily serving of flaxseed (just over half a teaspoon) was enough to lower breast cancer risk. While more research is needed, some studies suggest that for younger women who have not yet gone through menopause flaxseed reduces the risk of breast cancer and slows down the progress of certain breast cancers and other cancers that need estrogen to grow., A study published in 2013 found that eating flaxseed decreased a woman’s chance of getting breast cancer by 82%. Flaxseed (but not flax oil) seems to decrease bad cholesterol among people who have relatively high cholesterol., Once again, women who already went through menopause seemed to benefit most: their “bad” cholesterol dropped more than the bad cholesterol of men or younger women. This is important for older women, because bad cholesterol tends to increase after menopause, as estrogen levels decline. Flaxseed has the potential to benefit everyone as a great source of dietary fiber with almost no side effects. People with high levels of bad cholesterol and women who are post-menopausal benefit the most. Flaxseed is sold as whole seeds, ground seeds (flaxseed meal), liquid oil, and oil in a pill form. It can easily be added to cereal, baked goods, salad, yogurt, and many other types of food. Since whole seeds tend to go through the body undigested, ground seeds are considered to be more beneficial. Flaxseed oil delivers essential fatty acids but it doesn’t have fiber or lignans. If you want to get all the benefits of flaxseed—omega-3 fatty acids, fiber, anti-oxidant and cancer-fighting properties—choose ground flaxseed. Few side effects have been reported from flaxseed. When taken to reduce constipation, it should be taken with plenty of water. The fiber in the flaxseed may also lower the body’s ability to absorb medications that are taken by mouth, so it should not be taken at the same time of day that you take pills or dietary supplements. Flaxseeds are a great source of dietary fiber and omega-3 essential fatty acids for men and women of all ages. They don’t have any known serious side effects, and ground flaxseeds are easy to include in the foods you eat every day. 3. Gebauer S, Psota T, Harris W, and Kris-Etherton P. n-3 fatty acid dietary recommendations and food sources to achieve essentiality and cardiovascular benefits. American Journal of Clinical Nutrition. 2006; 83(6): 1526S-1535S. 6. Brown L, Rosner B, Willett W, and Sacks F. Cholesterol-lowering effects of dietary fiber: a meta-analysis. American Journal of Clinical Nutrition. 1999; 69:30-42. 10. Lowcock E, Cotterchio M, & Boucher B. Consumption of flaxseed, a rich source of lignans, is associated with reduced breast cancer risk. Cancer Causes Control. 2013. E-publicaton ahead of print. Retrieved from http://www.ncbi.nlm.nih.gov/pubmed/23354422. 11. Pan A, Yu D, Demark-Wahnefried W, Franco O, and Lin X. Meta-analysis of the effects of flaxseed interventions on blood lipids. American Journal of Clinical Nutrition. 2009; 90:288-297. 12. Fukami K, Koike K, Hirota K, Yoshikawa H, and Miyake A. Perimenopausal changes in serum lipids and lipoproteins: a 7-year longitudinal study. Maturitas. 1995; 22:193-197.